Now that Google Reader is officially gone, most folks have settled on a replacement of some sort. In fact, a few months ago I even went through the process of installing Tiny Tiny RSS as a viable and powerful replacement. 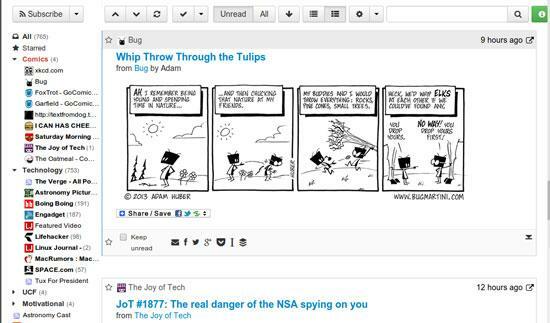 At the time, there was only one feature I sorely missed, the "next unread blog" link. Approximately three days before Google Reader shut down for good, I found the holy grail of RSS readers: CommaFeed. CommaFeed is an open-source project written in Java. It's offered as a free Web-based solution at https://www.commafeed.com. Although the interface is similar to Google Reader, it feels slightly stripped down. Thankfully, it provides a bookmarkable link that will take you to your next unread RSS entry. That feature is the single most important, and difficult to find, RSS reader feature I need. CommaFeed unfortunately doesn't have a really good mobile interface, and it's lacking features in its Android app, but improvements are being made on both fronts. I must admit, however, that even more important than the "next unread blog" link feature, is the ability to download the https://github.com/Athou/commafeedsource code from GitHub and compile CommaFeed for self-hosting. I don't ever want to get "Google Reader'ed" again. Hosting is complicated, because it's a Java application, but the instructions on the GitHub site make it fairly painless. I recommend trying out https://www.commafeed.com before compiling and self-hosting, because CommaFeed's interface might not be for everyone.